Tens of thousands of items ready to ship the same day. 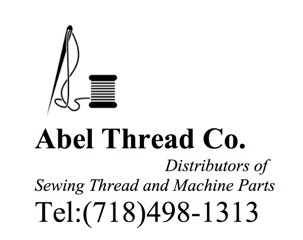 If you do not see what you are looking for, Please Email abelthreadco@yahoo.com and you will be contacted immediately. New items are added every week. We Value your business. We treat your orders with the utmost care and urgency. Please note that there is a $35.00 minimum on all orders. For orders to be shipped outside of the United States there is a $100.00 minimum Please email orders to abelthreadco@yahoo.com for special instructions.